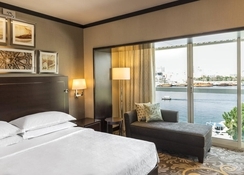 Sheraton Dubai Creek Hotel & Towers in Deira is one of the oldest 5-star properties of Dubai and offers a comfortable stay in a strategic location offering magnificent views of the iconic Dubai Creek. With easy access to cinema, city centre, tourist information, supermarkets, bus stops, disco, bars, shops and restaurants, theatre, taxi stands and train station, the entire city is within easy reach of the hotel. A top favourite of tourists, this family-friendly hotel offers excellent guest amenities and warm middle eastern hospitality with a human touch to make guests feel at home in the sunny city of Dubai. A large swimming pool, a mini market, a lounge, a lobby, a reception, shops and a conference room meet every need for those travelling for business and leisure. Excellent room views, romantic lighting and dining options make it a favourite of honeymooners too. 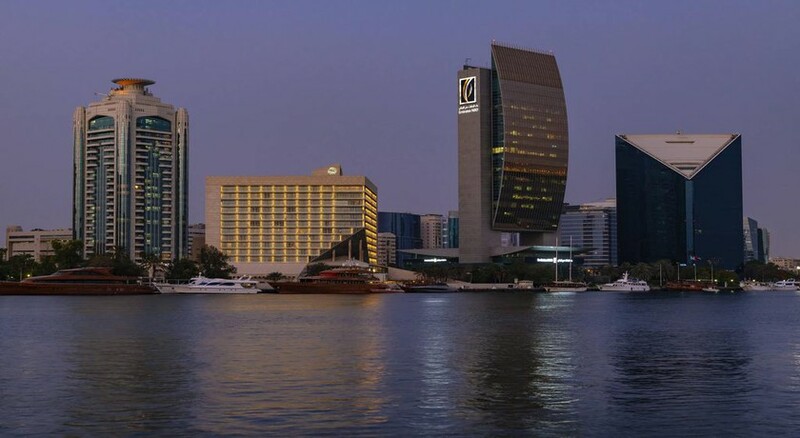 Sheraton Dubai Creek Hotel & Towers is shaped like a boat and situated on the bank of the Dubai Creek. Besides walking to the nearby attractions like Deira City Centre, Spice and Gold Souks, taking an abra or water bus/taxi is also an option. The hotel is 12km from the Al Mamzar Beach Park and the Dubai Mall. The Dubai International airport is about 6km from the hotel. 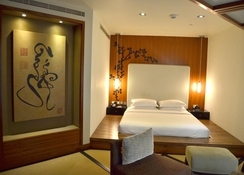 Sheraton Dubai Creek Hotel & Towers has spacious rooms and suites with plush furnishing spread over 14 floors. The air-conditioned rooms have large floor to ceiling windows offering great views of the Dubai creek and the cityscape. The rooms are equipped with King or Twin beds, divan, en-suite bathrooms, free Wi-Fi and flat-screen satellite TV. Guests have access to Club Lounge and can enjoy complimentary breakfast. The hotel has few of the oldest 5-star restaurants offering authentic cuisine from Asia and Europe. While Vivaldi offers fine Italian dishes by Alfredo Russo, Creekside Japanese offers excellent sushi and Japanese cuisine. There’s also the Hatta All-Day Dining and Friday Brunch for the guests to enjoy. It has a British pub – Chelsea Arms Pub and dinks are also served at the Lobby Café in a relaxed ambience. Sheraton Dubai Creek Hotel & Towers offers various recreational amenities for guests. It has a large swimming pool with beach towels. There is a relaxing spa with sauna, massages and relaxation rooms. For the gulf enthusiasts, there is a golf course 10km from the hotel. There are excellent shopping arcades at the spice and gold souks, and malls such as Bur Juman and Deira City Centre.